Despite similar genetic backgrounds and similar diets, large variations in production performance of commercial growing-finishing pigs exist among farms, writes Matthew Wedzerai, writer in the pig husbandry and animal feed industry. Health status is the major contributing factor to this variation in pig performance. 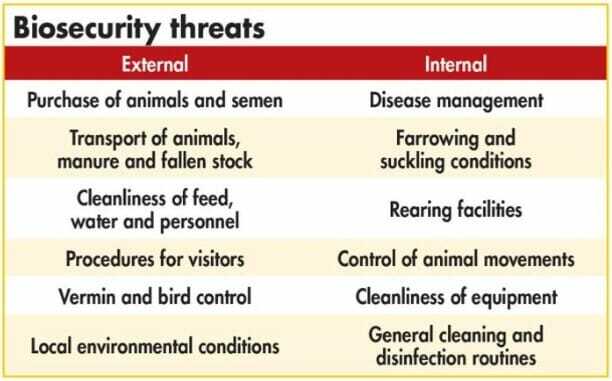 If pig farms are classified according to their health status, targeted feeding strategies can be implemented for farms that share common health status. The interesting question that was answered in this study (conducted at Wageningen University, The Netherlands) was: which amino acids (AA) utilisations and requirements are affected by differences in health status? This is important since current requirement estimates for growing-finishing pigs are formulated to maximise protein deposition for growth without necessarily considering the increased utilisation of amino acids for immune functioning, as induced by health challenging conditions of farms, and in addition, these nutrient requirement experiments are largely performed under good sanitary conditions. Under sub-optimal health status, it is expected that utilisation of amino acids is diverted more to production of acute phase proteins (immune-related proteins) than towards normal body protein accretion for growth. Before reviewing the results of this study, let’s look at how pig farms were classified into different health statuses. percentage rejected lungs, and livers at slaughter over a period of one year. For each individual farm, a score was calculated per trait by inter- and extrapolation using the 25th and 75th percentiles from the Dutch growing-finishing pig population as reference. The farm score was defined as the mean score over the six trait. In total, 28 barrows (Dutch Landrace X York) of similar age at arrival (55 ± 0.4 d) were used. Barrows originated from either a farm of high health (HHS; n = 14) or from a farm of low health status (LHS) (n = 14) as assessed by a serological monitoring programme for the presence of antibodies against a number of pathogens in pigs. Pigs from the low health status farm; with a sub-optimal health status, had greater serum haptoglobin, lower serum albumin concentrations, and greater leukocyte counts in blood at the start of the experiment than pigs selected from a farm with a high health status; indicating a higher level of immune system activation. The main aim of the study was to determine the effects of health status and dietary AA deficiency on nitrogen (N) retention and AA utilisation in growing pigs. The isotope dilution technique was used for measuring changes in the metabolic utilisation of various essential amino acids. A low health status results in higher immune stimulation, resulting in tryptophan becoming limiting, whereas lysine becomes excessive. The utilisation of methionine, tyrosine, and valine for immune system functioning increases in pigs with an activated immune system (low health status), associated with an elevation in serum concentrations of acute phase proteins. LHS pigs had greater counts of total leukocytes, granulocytes (sum of neutrophils, eosinophils and basophils) and lymphocytes than HHS pigs, indicating high immune stimulation. LHS pigs had greater faecal N excretion than HHS pigs. Before considering farm-specific feeding strategies, it is important for pig farms to upgrade the health status of their farms. Among other factors, nutritional solutions and biosecurity are the two main strategies to improve the health status of farms. feed quality e.g. reduction of mycotoxins. Improving gut health improves integrity and microbial balance of the GIT, resulting in better disease resistance, since the gut is key to immunity. At the same time, optimising gut function improves feed conversion and growth rates. • Firstly, it is important to know that the six traits used to classify pig farm health status was concluded to be a useful tool to categorise growing-finishing pig farms on the basis of their health status. • A low health status results in higher immune stimulation, resulting in tryptophan becoming limiting, whereas lysine becomes excessive. • The utilisation of methionine, tyrosine, and valine for immune system functioning increases in pigs with an activated immune system (low health status), associated with an elevation in serum concentrations of acute phase proteins. • Before implementing targeted feeding strategies for farms sharing a common health status, future research should be conducted to study the possible beneficial effects of increasing the dietary supply of particularly tryptophan, methionine, tyrosine, and valine relative to lysine for immune system function, and for body protein deposition in pigs from farms with a different health status. • Feeding strategies should not be aimed at preventing protein breakdown during disease, but at providing sufficient amino acids for body protein synthesis for growth and immune functioning. Kampman-van de Hoek, E., 2015. Impact of health status on amino acid requirements of growing pigs: Towards feeding strategies for farms differing in health status. Wageningen University. has been contributing to the pig and feed industry through his articles based on scientific research. provides professional copywriting and editing services.